I feel like seasonal wish lists might be a thing I start to do here on the blog more consistently. I really love looking through what's new or up and coming in the beauty world each season and putting together a list of what I want and why I want it. 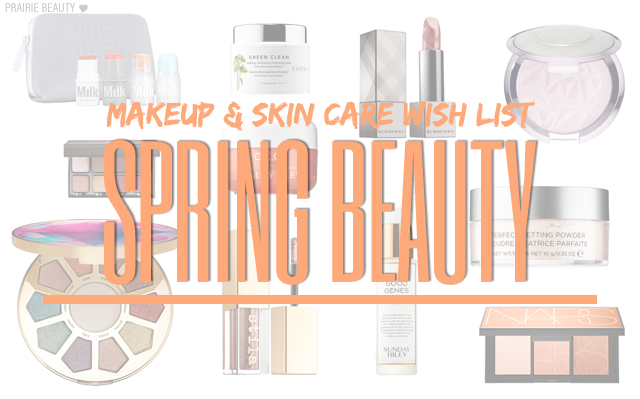 This wishlist is a little bit different from some of my other wishlists, because I decided to include skin care products that I'm lusting after as well. So without too much more rambling, keep reading to take a look at what I'm lusting after! I recently swatched this in store at Sephora and felt a little bit swoony, but I managed to restrain myself from buying it because I wasn't entirely sure how I would use the two deeper shades. That said, this is just gorgeous and I am 100% sure that I would find a way to use it. Here's a secret... I don't actually own any of the Becca Shimmering Skin Perfector Pressed Powders. I've resisted picking them up until now because I've only just recently become a highlighter person and these always seemed way too intense for my taste. But this is just so pretty and I think it would be perfect for my skin tone! The reason that this palette really speaks to me is because I really think these shades would be workable on my fair skin, which can be hard to find. I haven't swatched these myself yet, but I have every intention of heading down to Sephora and trying it out soon! I feel like I'm forever on the hunt for the perfect setting powder for my undereyes and I've heard such great things about this powder that I've really been dying to try it. I wish they would put out a smaller size though, because I struggle with spending that much on a setting powder if I'm not sure I like it yet. This is another product I've heard really, really good things about and I've been eyeing it up since the first time I saw it thinking I should get my hands on it. I've been on a bit of a primer kick recently and dying to try more, so this is going to stay on the wishlist for a while I think. I swear, I've really heard nothing but good things about MILK Makeup and now that they're finally available in Canada I'm definitely looking forward to trying out some things from the line. I feel like this set is perfect because it gives you four different products to try out from the brand - and honestly, that bronzer has been on the wishlist ever since I saw it mentioned by Pixiwoo. Is there currently a more hyped product out there than these? I really don't think there is. I've actually tried to pick one of these up a few times, but they've consistently been sold out and I haven't been able to get my hands on them. I will though - one day! This basically jumped right onto my wishlist as soon as I saw it. The shades are just gorgeous, colourful without being too much for my generally neutral bound self, and I feel like they would just add incredible pop to looks all year long. I have a feeling I'll pick this up once I've gotten my fingers in it to swatch it. This is another palette that I've been eyeing for a while that always seems to be sold out. With all of the hype around the quality of Viseart shadows, I've been dying to try them but I just can't seem to convince myself that it's a good idea to spend $100 on a palette without ever trying the shadows - enter this little baby palette. I will buy this one once it's back in stock. Charlotte Tilbury is another brand that I haven't bought anything from yet - and not for lack of wanting. When it comes to more luxury makeup brands, I want to be able to swatch and test things before I buy them, but this might be the exception since I'd have to order it online. I've heard enough good things and seen enough swatches to take the chance. I mean... PRETTY. This is another range of lipsticks that I've heard incredible things about since they launched. I've actually been fairly underwhelmed with the lip options from tarte in the past, but I'm always willing to give a new formula a try - and who wouldn't love to pull out this bullet to apply it during the summer? Yes, I am the packaging target market. Burberry is another brand that I've had my eye on, but never pulled the trigger on picking up, and I can basically echo everything I said about Very Victoria about English Rose No. 17. It's so gorgeous and every swatch I've seen has given me grabby hands, so this might be one I'm willing to order without trying it out first. I am still on the hunt for the perfect cleansing balm and something about this one from Farmacy called out to me. I feel like as much as I like the cleansing oils that I use normally, I'm really drawn to the luxurious feeling of a balm, so I'd like to get this one on my skin and see if it lives up to what I want it to. This has been on the wishlist for a LONG time and it still remains there. I'm actually on a bit of a cleanser kick lately, trying out a lot of different ones at vastly different price points, so I'm definitely grabby hands to throw this one into the testing process. Still... I have $10 cleansers that I really love, so spending 10x that has been something I just haven't been able to bring myself to. This is new to my wishlist, but actually probably the most wanted at the moment on this list of three. The biggest thing I'm looking for at the moment is a great cream cleanser that leaves my skin with that perfect balance of clean, soft, and nourished and I have a sneaking suspicion this could be the one. Know what I mean? Grabby hands. I've actually been using samples of this serum for the past few weeks and I'm a little bit obsessed with it. The effect on my skin is pretty much immediate and every time I use this, my skin looks absolutely incredible the following day. I've been overall impressed with Dr. Dennis Gross products, but this one has really jumped to the top of the list. This has actually been on the wish list for a while as well, after hearing it pretty much raved by Caroline Hirons - whose advice has seriously changed the way I look at skin care and whose product recommendations have never steered me wrong - and if this was available locally I'd definitely have already picked it up. Having never actually tried Advanced Night Repair, I feel like I'm missing a giant piece of a puzzle and I really need to get on it. I just feel like this is a staple product that I need to get on my skin to really see how I feel about it. Reviews I've heard have been mixed, but it's basically OG, so I basically have to try it. I picked this up on a 100 Point Perk from Sephora because I wanted to try a sample before investing in it... and I'm sold. This is another one of those products that I see results with right away. I just have a good skin day when I use this - so I'm in! Honestly, I couldn't tell you what makes me want to try this outside of the fact that I'm pretty enamoured of Sunday Riley products and I love the C + E antiOXIDANT thing. I mean... do I need more than that? I think I'm going to try to score a deluxe size of this to try it out. This is another one where... there's just something about it that makes me feel like I need to try it. Could possibly be that the swirl is just super pretty or the fact that I love the idea of it being part cream, part gel. Either way, this is another one that I really want to get my hands on a sample of. Annnnd speaking of samples. I got this in a point perk and I'm a little bit convinced that this would be the perfect summer daytime moisturizer for me. It's super light in texture, but I really feel like it hydrates beautifully and I love wearing it during the day because it plays perfectly with my makeup. Spendy, indeed, but I really want the full size for summer days. Annnnnd there you have it. A vaguely exhausting list of all of the things that I would add to my cart right now if I had the budget to buy all of the things that I want. Because I don't have the budget for that, I know that only a handful of these will end up going home with me - but I'll try to make it the good ones. I'd love to hear in the comments what's on your wishlist at the moment - whether it's any of these products or something else!